Sand Under My Feet: Gata - Flavors of Bicolandia Atbp. 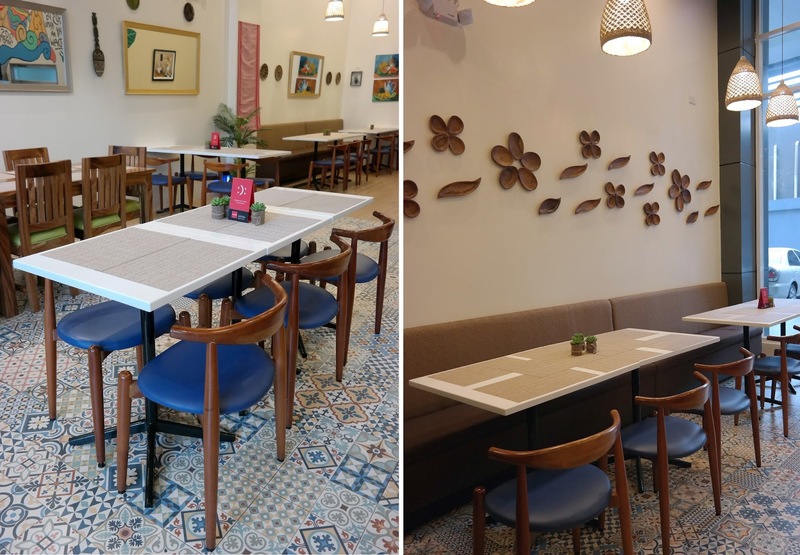 There’s this fairly new restaurant in Quezon City named Gata which offers the flavors of Bicolandia. It is one of the first Bicolano themed restaurant in the Metro Manila. This place is a shout-out to a regional cuisine that deserves more attention. 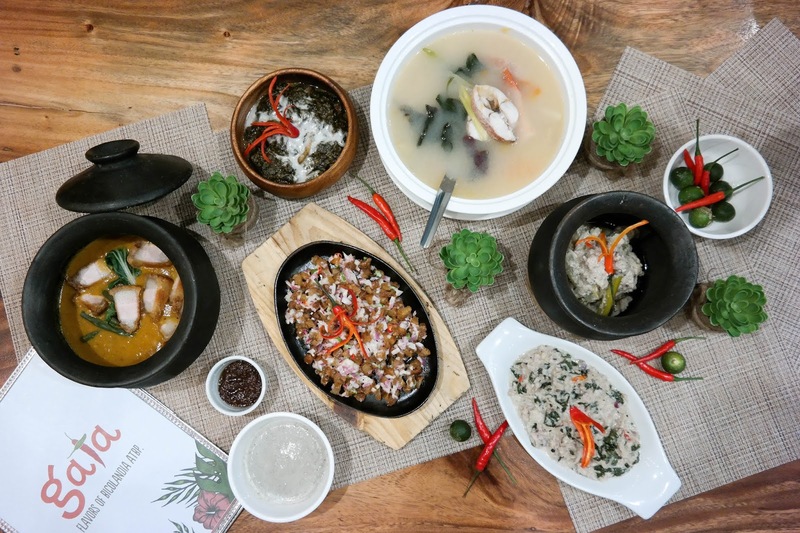 Bicolano cuisine focuses heavily on complex but more sophisticated taste profiles that heavily uses one ingredient that is very abundant in the region - gata or coconut milk. Besides gata and spicy-based dishes, Gata is also serving authentic home-cooked recipes and classic Filipino Favorites. Gata Restaurant is one of the first Bicolano themed restaurant in the Metro. We are serving authentic home-cooked recipes and classic Filipino Favorites. Gata has other choices that give nod to the usual Filipino Favorites and some original dishes with western influences. Sinantol with Kamote Chips - sinantol is made with minced cotton fruit (santol) and is cooked in coconut cream. I’ve tried this dish quite a few times before but to be honest I never found fondness with it. Propbably because it is an acquired taste. But when paired with the sweet camote chips, it’ll give you an addictive sweet and tangy flavors that you won’t be able to stop munching and dipping. Cocido Na Buong Lapu-Lapu - sour broth similar to Sinigang but less maasim and very Bicolano. Also comes in Shrimps. This is a dish that I’ve tried for the very first time in my entire life. Being someone who finds comfort in Sinigang and can eat it for days on end, the sourness of this Bicolano version is very different. It uses Calamansi for give it a tangy flavor but it is not as sour. The subtle Calamansi flavor is a good combination with the Lapu-Lapu (grouper or cod). The lapu lapu’s meat was fresh, creamy and slightly sweet. Laing - the Bicolano heavyweight. Often attempted but never perfected. Gata’s dried gabi leaves are directly sourced from Bicolandia. I love laing! And every laingthat I have eaten made by true-blooded Bicolanos are really the best ones. I like that the taro leaves and stems of this Gata version doesn’t leave my tongue or throat itchy. The coconut cream flavor is also very distinct. As for the spiciness, it was something that I can tolerate. Kinunot Na Pagi - flaked stingray with malunggay leaves and simmered in gata. Adventurous and delicious! It’s quite exotic and not everyone would find a liking to it that easily, but guess what? This was everyone’s favorite! It had this equally addictive tangy, sweet and salty flavor. The sting ray meat doesn’t also have that fishy stench. People may think this dish shouldn’t be eaten because it uses sting ray. The owners told us that Bicol being a coastal region, stingrays are abundant there and usually they don’t fish for them. Fishermen only sell what gets caught together with the other fishes. Probably also why almost all the sting ray dishes you could find is a bit pricey. Crispy Okoy with Sukang Tuba - these are tiny shrimps made into fritters and dipped with a regionally produced type of vinegar. It was a good thing I took my antihistamine before going to Gata as this would cause me an allergy attack. But Okoy is one of those snacks I love eating Everytime I get the chance too. This was so good, crispy and went super well with the sukang tuba. Laing Bites with Gata Dip - a cool take on laing as an appetizer. This was good to munch on and had the same flavor as the regular laing just with some added crunch due to the crispy fried rice paper vehicle it is in. Ginataang Kuhol - snails or for more upscale term escargots cooked in coconut cream. I love dish even when I was a kid, my late father occasionally used to cook this. So it is a dish I get excited about when some people might cringe with just the thought of eating snails. I love how quite rubbery the snail meats are. I picked a couple of them out and then drizzled them with generous amounts and coconut cream and ate them with a spoonful of rice. So good!!! Adobong Manok sa Gata - a tasty dish wherein the chicken is slowly simmered in gata until naglalana-lana. Though adobo is the national dish of the Philippines, there’s so many versions of it across the Philippines. But I got to say this adobo with gata is one of my favorite versions. We also cook this version at home. Of course this was super tasty, creamy and savory. Hello, anything with gata is better right? Right! Pork Sisig with Gata - though sisig is a Pampangeo dish, put gata or coconut milk on it, it’s already Bicolano hahaha! Anyway, this was good as well but quite spicy for my liking. Kare-Kareng Bagnet - made with Gata’s own bagoong recipe that will surely make you say sarap! Guess what? This has gata too! Making the stew’s sauce tastier and creamier. The bagnet on the other hand is an Ilocano dish; the meat here had crispy skin, fat that almost melts in your mouth and tender meat part. Halo-Halo Turon with Ice Cream - I love halo-halo, I love turon, I love ice cream therefore I love this dessert. Although picture here is a sampler size, the normal serving is a whole turon. What I like about this restaurant is that they locally-source ingredients from Bicol from independent farmers and fishermen. They strive to source some of their ingredients like laing, tinapa, vinegar and other delicacies from small suppliers in and around the Bicol Region. The owners want to help improve Bicolanos with their livelihood using their produce in Gata’s dishes and introducing them to the Manilenos. Moreover, they still use traditional ways of producing their products which allows for a much better quality. Also, I can’t reiterate it enough, everything is better with gata!